We are the only company to specialise in measuring employee well-being. We do this using assessments which staff complete anonymously. 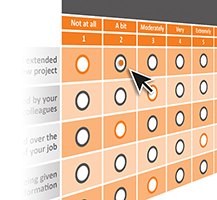 We offer three assessment options to suit all budgets and types of workforce – from our standard Hive25 option (25 questions drawn from scientific study over 10 years), to sector-specific assessments and a fully bespoke package. Organisations use the results from these assessments to build a strategic health and well-being programme which is more likely to be effective because it is based on the actual needs of those for whom it is intended. Employers can either compile their own summary of findings using our secure on-line reporting interface HealthHive™, which presents the results using a variety of graphics and charts, or we can do this for you. Our assessments take less than 7 minutes to complete. This means the results are valid so you can rely on them when planning your employee well-being programme. We offer three assessment options to suit all budgets and workforces. Due to the engaging nature of the questions, employee take-up is very high. Response rates are usually over 70%.